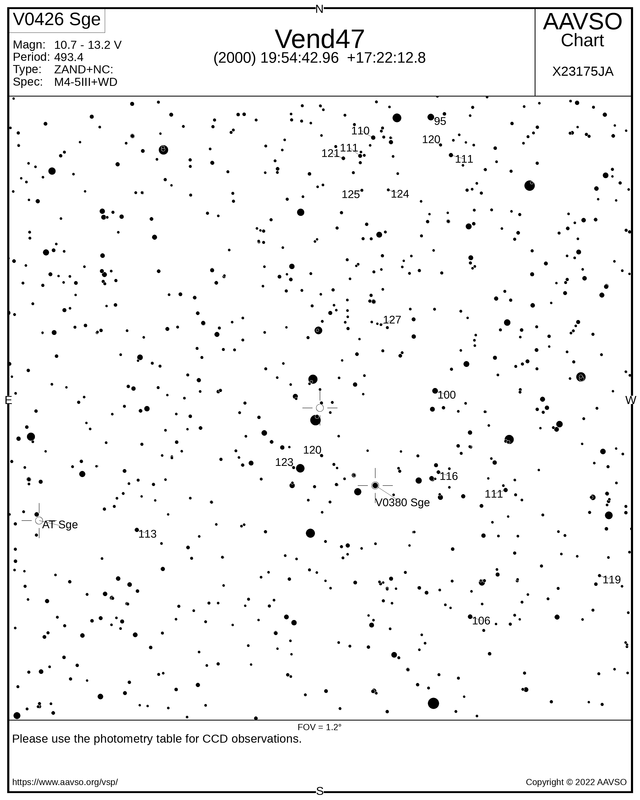 Robert Fidrich has discovered a rise of HBHa 1704-05 (V~12.0 on July 31.945 UT, V~11.7 on Aug 3.989, and V~10.7 mag on Aug 8.938). Paolo Berardi obtained a spectrum which clearly identify the object as a new discovered symbiotic star. Standstill in V? - And what about in B? It confirms my DSLR results, that there is no significant change in the V brighness in the last few days. I have uplaoded BVI data for this star. I mag is about 9.13, V mag is 10.89, B mag is 11.47. Errors are about 0.01. The name "Vend47" was also accepted, so that you can submit observations or create AAVSO chart in VSP using the name Vend47 too (easier to remember and type it than the primary name ASASSN-V J195442.95+172212.6 listed in VSX.